Research has shown that the spread of viruses and bacteria can largely be prevented with proper hand washing habits. Hand washing is the first line of defense against infection and it is one that we can easily control. 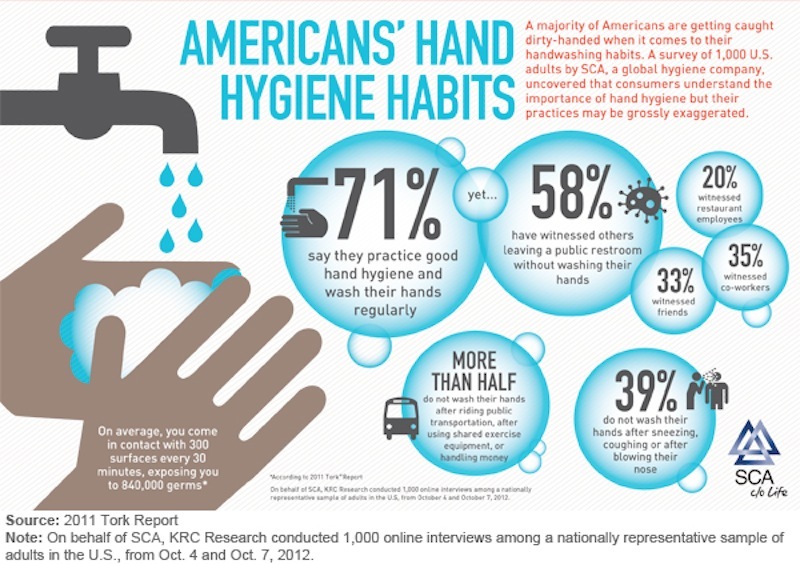 There are some troubling results found by a survey done by KRC Research for the global hygiene company SCA. They discovered that we simply are not washing our hands as much as we should. To help we thought we would gather a few best practices for hand washing. 3: Lather up. Using circular motions scrub both sides of your hands and wrists. Don’t forget to get under and around your fingernails. 4: Wash for 15-30 seconds. Sing Happy Birthday or the ABC’s to help you with this timing. Wash thoroughly, but make sure you give the soap enough time to do its job. 5: Rinse: Keep your fingers pointed down, make sure you don’t touch the sink. 6: Use a towel to turn off the water. If it is automatic, let it run it’s cycle. Do your best to not touch anything with your hands, especially if you are in a public restroom. 7: Dry your hands with a towel, or air dryer. • After touching animal food. Do you have any hand washing techniques or best practices you’d like to share? This entry was tagged CDC, Centers for Disease Control and Prevention, Environmental health, HAI, Infection, Michigan State University, Public toilet, Soap, Wash hands, Washing. Bookmark the permalink.